If you love diving and would like to become a PADI Divemaster then join our Divemaster Course and make that dream a reality. At the end of the experience you will have the ability and knowledge to lead certified divers and have the confidence to go diving anywhere in the world. What can I do as a Divemaster? 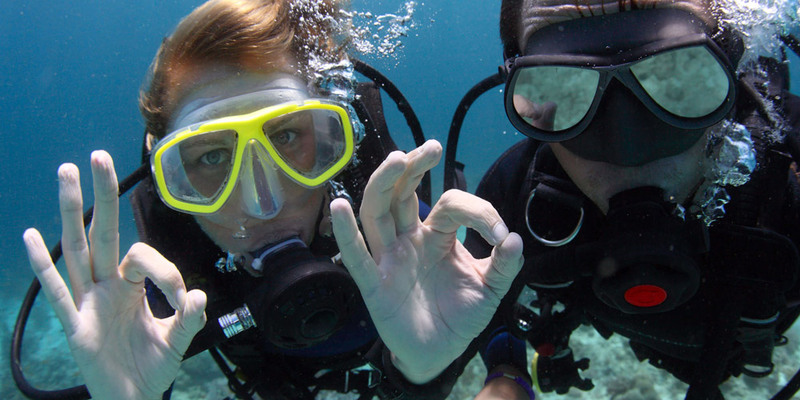 A PADI Divemaster is a recreational diving role which includes organising and leading dives. A Divemaster will assist the Dive Instructor to run PADI diving courses. As a PADI Divemaster you will be able to lead certified divers on recreational dives and assist a PADI Dive Instructor with students on and under the water. PADI Divemasters can also teach and certify skin divers and teach PADI Snorkeling programmes. You will have the knowledge to work in-store advising customers on courses, equipment and becoming a PADI Divemaster. The qualification you achieve will allow you to be able to work at any PADI dive centre around the world. You will become a much better and confident diver, giving you the opportunity to dive and explore this big blue planet. If working or looking for work on a Superyacht, then having your PADI Divemaster is a useful certificate to have when looking for a job as a Deckhand. What does our Divemaster course cover? The Divemaster course will teach you the role of a Divemaster, as well as giving you the knowledge and confidence to lead others. We do this course through leadership and skills exercises. You will spend a lot of time diving, exploring and getting to know the dive sites. You will learn all about the equipment, how to refill the dive tanks and service your dive gear. We will show you how to map a dive site making sure there are no hazards and ensure the customers who are enjoying their dive you can find their way back to the boat. You will complete the Emergency First Aid Response course and the PADI Rescue Diver course. You will experience what it is like to run a busy dive centre, and how to organise and manage dive courses. This will lead on to customer relations and effective communication skills. You may become a fantastic diver but without good communication and leadership, your customers may not understand what is being asked. After the eight week course you will have all the knowledge and skills needed to be a competent Divemaster. Where do we run our Divemaster courses? All our dive training is run in Vassiliki, Greece, a four hour flight from London. With its warm clear water, sunshine, great night life and plenty to see and do you will have an amazing time both under and on top of the water. The dive conditions in Greece are fantastic; everybody who has been diving loves the conditions. All the expert Instructors love their sport and are passionate about what they do. The great thing about Vassiliki is the additional activities that are available. There is everything from windsurfing, dinghy sailing, stand up paddleboarding and mountain biking. If you are, like us, adrenaline junkies then Vassiliki is the place for you. The bay comes alive at night and, with many bars and restaurants to choose from, you are never short of something to do when you are not under the water. When you sign up to our PADI Divemaster course, we can arrange your accommodation and flights. Flying Fish is ATOL protected for your reassurance. Flying Fish have been operating in Vassiliki running Divemaster programmes for the last five years and the feedback has been amazing. The eight week Divemaster Fast Track is our best-value route from novice diver to PADI professional. Learn to Scuba Dive is the perfect introduction and forms the first Part of our Divemaster Fast Track. This programme is ideal if you are considering taking part in professional diver training in future. Gap Year experience consists of 3 Watersports in 3 weeks in the stunning bay of Vassiliki, Greece.